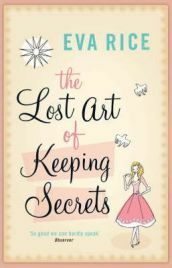 On the surface, Eva Rice’s debut novel The Lost Art of Keeping Secrets seems almost like “chick lit”. On closer inspection it really is much more. Before there was Elvis, there was Johnnie Ray – an American pop singer who made girls all over the world swoon, and teenaged Penelope Wallace was one of them. And for her, he was the one bright star in the dreary world of post-WWII England, still rife with shortages – especially cash. One day, Penelope is waiting for a bus when the charismatic Charlotte Ferris sees her and practically kidnaps her for an afternoon tea at her Aunt Claire’s house. And that was when everything changed, not just for these two girls, but for just about everyone in both their families. As these two upper-class but financially impoverished 18-year-olds become fast friends, the learn more about each other, their worlds and the people in them. What’s more, it seems like everyone has some sort of secret they’re keeping. This is The Lost Art of Keeping Secrets and is a novel from Eva Rice. On the surface, this book could easily be considered “chick-lit”. In fact, throughout most of the story, you may get the distinct feeling that the romance elements are very much in the forefront of the plot. We have Charlotte’s cousin, the fascinating looking Harry who wants to be a magician and is in love with an American actress who just dumped him for a man with more means. As Harry ropes Penelope into a scheme to get her back, we know something is going to sizzle. Charlotte too has eyes for a boy, one of the “Teddy boys”, who her Aunt doesn’t approve of. And then there’s Rocky, the dreamily handsome, much older American man from Hollywood who meets Penelope on the train. Plus, with Penelope living in the shadow of her famously beautiful widowed mother, you can just guess where at least some of the secrets will be, and that love is at the center of all of them. Even Penelope’s younger brother Inigo is in love – but that’s with Rock & Roll music. However, on closer examination, the story here is a touch deeper than most “chick-lit”. In fact, many people might find that this is more of a ‘coming of age’ novel, and could almost be appropriate for the young adult market. This wouldn’t be far from correct, except for the fact that it seems a bit more sophisticated than that market usually requires, and the subtleties of the text and its underlying meanings would probably be lost on most teenaged readers. No, this is an adult novel which lies on the cusp of the literary and women’s fiction genres. This isn’t to say that men might not enjoy this book, but they’d probably need to quite in touch with their feminine side in order to do so. And of course, included here are the timeless themes of growing up with fads and fashion mixed with music and society, which anyone can identify with. Written in first person from Penelope’s point of view, Rice gives us an excellent look at the people that Penelope is interacting with. We are able to get to know Penelope as well, since much of the story is told in past tense, as a type of retrospective of the events. This is nicely mirrored within the story through the autobiography that Aunt Claire is writing with the typing assistance from her niece, Charlotte. Another nice addition to this is the fact that Penelope is not only reading literature, but seems to be interested in becoming a novelist herself. While there’s no “story within a story” here, the connectivity of writers and writing is evident throughout. Moreover, as Penelope unravels her tale, we get the distinct impression that this is the fodder for her first real book, which certainly Rice experienced herself. The overall feel of this book is one that many would describe as a “summer novel”. The tone is mostly lighthearted and the language is both clever, and easy to read with a simple beauty to it. Even the more serious passages are handled with a gentleness that pulls the reader in and takes them for a ride. When Rice describes the seasons and the views from in and around the majestic stately home of Milton Magma, where Penelope lives, one could swear her words could be set to music. In this Rice reveals that some of her talent comes directly from her lyric-writing father Tim. One particularly nice thing about this book is that you won’t realize until the end just how complex these character’s lives really are. And yet, like real people they almost breeze into and out of their troubles without fully understanding how they got into them, how they’ll come out of them, and what effect it will have on them or the people they encounter. This gives the novel a real honest feel to it which was a welcome one, indeed. In all, The Lost Art of Keeping Secrets is a lovely novel. The writing is lovely and the story is interesting with characters you can easily picture in your mind’s eye. Eva Rice has a way of enticing you to read on and then adds some interesting twists just to keep you interested. There was only one loose end at the finish that bothered me a touch, but the ending, which brings some closure wasn’t sappy. When you close the book, you’ll feel like you have a good idea what will happen to these people’s lives, without being told. Plus, Rice seems to have done her homework on the period, and included some nice touches along the way (not the least of which was getting me interested in finding some Johnnie Ray recordings). This book deserves a solid four out of five stars and comes well recommended. 2 Comments on "The Lost Art of Keeping Secrets"
I am always on the lookout for a good read in the “Women’s Fiction” dept. although I sudder at that label. Once in a while though you come across a good one, and by this review, this looks to be just that. I am just finishing up a great read by Barbara Hinske, Coming to Rosemont. By definition a Women’s Fiction, but it was so much more. barbarahinske.com of anyone needs a great book to add to their tbr list. I have certainly added this one to mine! Thanks fo the post! I bought this years ago when it was first released because it had a pretty cover and pink edging on the pages. Fortunately what was inside turned out to be just as good.